In Bill's first comic adventure, the TARDIS crashes into the heart of a Viking camp! But this is no interactive history lesson, and it seems that a terrifying alien force has taken hold over the icy kingdom. As the snow melts, the Doctor realises that he is about to face an unwelcome face from the past� And in a one-shot adventure, the Doctor takes Bill and Nardole on a trip to an intergalactic supermarket, where they make an unexpected new friend! 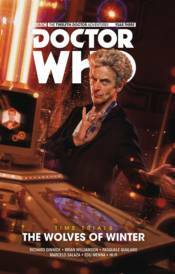 Collects Doctor Who: The Twelfth Doctor Year Three #5-7 and #9.